The Paint horse's colorful coat pattern defines the breed, it is the most obvious trait. However, Paint Horses must also possess a distinct stock-type conformation. Paints come in an endless variety of patterns. Markings can be any shape or size, and located virtually anywhere on the Paint's body. Their coat is always a combination of white with any of the basic colors common to horses: black, bay, brown, chestnut, dun, grulla, sorrel, palomino, gray and roan. Regardless of color, no two horses are exactly alike in coat pattern. Although Paints come in a variety of colors with different markings, there are only three specific coat patterns: overo, tobiano and tovero. For registration and breeding purposes, American PAINT HORSES are categorized by three distinctive types of coat pattern. 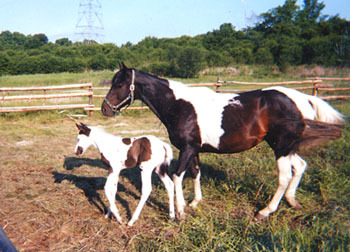 The tobiano (pronounced: tow be yah' no) pattern is distinguished by head markings like those of a solid-colored horse; their heads may be completely solid, or have a blaze, strip, star or snip. Generally, all four of the tobiano's legs are white, at least below the hocks and knees. Their spots are regular and distinctly oval or round, extending down the neck and chest, giving the appearance of a shield. Usually a tobiano will have the dark color on one or both flanks - although a tobiano may be either predominantly dark or white. The tail is often two colors. 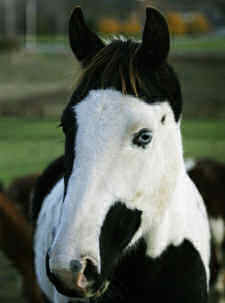 The overo (pronounced: oh vair' oh) pattern may also be either predominantly dark or white. But typically, the white on an overo will not cross the back of the horse between its withers and its tail. Generally, one or all four legs will be dark. Also notable is that overos have bold white head markings, such as a bald face. Overos generally have irregular, scattered markings. The horse's tail is usually one color.